Catching blue gills is so much fun, not to mention they make a delicious meal. Offering easy tips on what to use for bait, how to catch them, what they eat, habitat and more below. Blue gills are the most popular fresh water pan fish around. Children and adults alike love to fish for them, and if you see a bobber floating - that is a telltale sign that they are fishing for bluegills. Depending on what are you are from - they are also called brim, bream or coppernose. 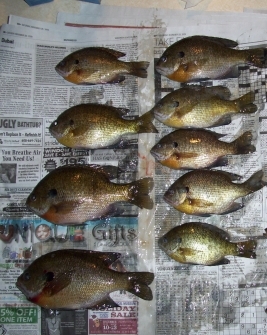 In some parts of the country they call the bluegill "sunfish" or put them in the "panfish" category. In the summer, they will bite on a lot of things. Use bait like worms, flies, live crickets, a kernel of corn, spinners and much more. In the winter when ice fishing, use wax worms and red worms when jigging and you can catch them anytime of the day. Here's a quick bluegill fishing tip: If your fishing at dawn or dusk try using a bright and colorful bait like red or orange. They spawn in June and this is when the males are on the spawning bed, protecting the eggs. Some of the males will change their color to match the females, and then the "guarding males" aren't aggressive towards them. Slick. Then they enter the nests and spawn. Depending on the size, they are often used as bait for larger predators like the musky, walleye and northern pike. Don't forget your stringer and net. Get your children out and fish for blue gills on a lake where they are known to live. They will love it. Who knows, you may have the next professional "fisher person" in the rough. Do you see the area that is fanned away and clear of any debris? That's their spawning bed, and he is guarding it with his life. The males "scope" the shallow areas looking for a bed that is not guarded by another male, and then fertilize the eggs they find. 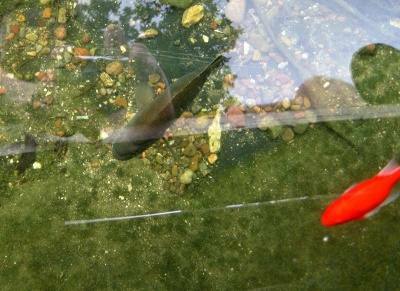 Bluegills prefer clear and quiet water on a sunny day. (I do too) After they are done spawning and the weather is warmer, you'll find them "hiding in the weeds" where it is cooler and abundant with food. Because bluegills prefer to stay in shallow water (under 9 feet), it's easy to fish off the shore or bank. On the lake, you will normally find bluegills under a fallen tree and in weed beds. In the spring and the beginning of the summer, they can be found in shallow water. Remember that the males are protecting the spawning bed, they bite on smaller lures at this time. In the heat of the summer, fall and winter, blue gills are found in deeper water (over 10 feet). Now, back to catching a blue gill. I can get off track easily, please bear with me. The bobber you want to use for fishing should be light enough for the gillies to pull under, and large enough to keep your bait afloat. You may use one or two split-shot sinkers approximately 2 to 2-1/2 inches above the hook, (use a number 8 fish hook) so the fish can see it down in the water. If it is too light, you will have the bait floating, and if it is too heavy, it will pull down on your bobber (and we can't have that). The bobber should be able to hold your bait at least 2 inches off the bottom of the lake. After you cast and the bait is sinking to the bottom, make "jerking movements" as it cascades down. This gets their attention fast. By the time the bait reaches the bottom, most of the time you will already have a fish on the line. If the bobber is jerking up and down a little, you have a fish nibbling. If the bobber starts moving away from you or the bobber is pulled under water; set the hook. (Pull up!) If you set the hook too hard, the hook will be ripped out of their mouth. Now walleyes are different, but I will get to that on another page. I have more than just information about blue gill fishing - check out navigation bar at upper left or below.